"Protest Kitchen is a welcome challenge to the world's most ignored social justice space--our own kitchens. Adams and Messina arm hungry advocates with the knowledge needed to bring trips to the grocery store into line with their values, all while providing practical mouth-watering cuisine to fuel bodies and souls. This delicious page-turner exists in a category of its own. Do yourself a favor and invite Protest Kitchen into yours!" "Protest Kitchen exposes the systemic abuses that result from standard industrialized eating patterns, and provides actionable advice for those who empathize with the exploited. This powerful book illustrates how we can resist oppression and create a more just and compassionate world through conscientious food choices." "In Protest Kitchen, Carol Adams and Virginia Messina make it very clear how what happens in kitchens, backyards, and other places where food is prepared and consumed has enormous impacts that go way beyond the walls of slaughterhouses, restaurants, and homes. Choosing a plant-based diet is, indeed, a significant form of protest and resistance against a violent, destructive, and discriminatory status quo, and the authors clearly show how personal choices can empower all individuals and make enormous differences not only for the animals and people involved, but also for society as a whole." "Protest Kitchen comes at a time in which most vegan cookbooks choose to be apolitical--choose not to ask their audience how either collusion with, or resistance against, an oppressive system goes beyond mere taste and desires and begins in the kitchen. Connecting powerful narratives with creative recipes, this book is a much needed gem for those ready to protest [and cook] against injustices such as speciesism, environmental racism, and misogyny. The personal [palate] is political!" 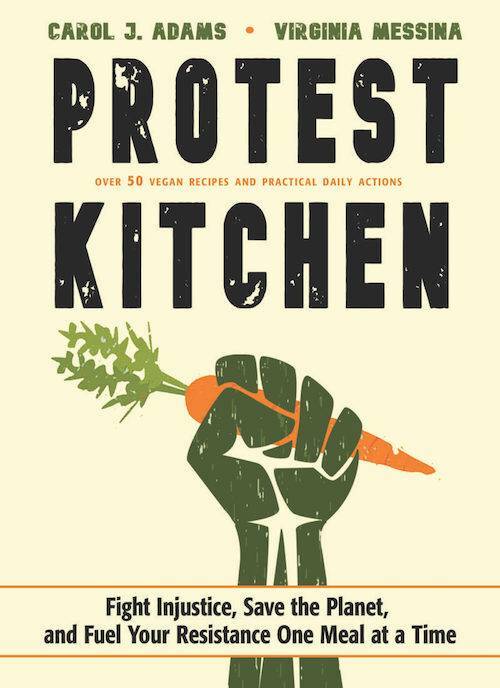 "Protest Kitchen's authors draw on their deep expertise in clinical nutrition and social justice to provide a deeply insightful look at how our food choices can unintentionally support racism, sexism, environmental damage and other social injustices. Dozens of delicious recipes make it easy to try meals with a lower injustice footprint - my favorites are the imPeach Crumble and the Trumped-Up Cutlets. This wonderful, game-changing book is a must-read for anyone interested in eating mindfully and avoiding collateral damage to society's disenfranchised and marginalized." "Protest Kitchen unpacks the sordid truths associated with our current food system. With action steps and easy and delicious recipes, this book is much more than a cookbook. It will open your mind to how all forms of activism are connected to restructuring food culture." "The personal is political--and delicious! Protest Kitchen shows you how to change the world...one kitchen at a time. When eating is a form of protest, every meal becomes an act of resistance, an opportunity for healing, hope--and Collard Greens with Black-Eyed Peas! Adams and Messina make it fun to align your kitchen with your politics. Go vegan for a day; then a week; then a lifetime."